Written on December 30, 2005 by Rylan & Kaitlyn. I don't even know where to begin writing. This last week has been so fun and exciting. My mom and dad told me that Christmas was coming but I had no idea I was going to have 4 days of it. I received so many gifts that I'm nearly swimming in them. I definitely think that my favorite toy would be the Gloworm that my dad picked up. My dad has noticed that a lot of people are looking for information on a Gloworm recall but he tells me it is safe to play with her because he cannot find any substantial information. I really don't know what everyone is worried about, how can my Gloworm be harmful? She is so loving and lets me hold her. I had the chance to meet my great aunts and my great grandma again this week. Everyone seemed very impressed with my abilities and they all get a laugh when I smile. They really seem to love me a lot, seeing as they gave me a bazillion gifts. Last night, I talked with my grandma on the phone. We had a short conversation about me being good. Speaking of being good, the new year is nearly here and I need to make a resolution. My resolution for 2006 will be to take longer naps, not to go potty in the bathtub and to stop sucking in air when feeding. I think that these are all possible. A more difficult thing that I need to work on this year would be letting mommy and daddy eat a full dinner without me crying. Its so hard to resist when I smell their food, it makes me hungry too. Written on December 29, 2005 by Kevin. If you ever flip through the television channels, you will most likely see the latest commercial from Walmart. The Christmas commercial with Queen Latifa and her mother in which they are trying to decide what to get everyone. Her mother walks into the store and heads straight towards the gift card booth. The end of the commercial shows a gift card with Queen Latifa and I had wondered whether or not you could actually purchase one with her face on it. I never did figure out but Rylan's grandma did one better. Walmart recently started offering personalized photo gift cards in which you can put any picture you want onto a gift card. The cards can be done horizontally or vertically and cost under a dollar. Rylan's grandma surprised my wife and I with matching gift cards with Rylan's face on it. The first thing that came to my mind when I saw then, besides how cool they were, was the fact that it looks like Rylan is about to punch the camera. Rylan normally gives the paparazzi their chance to get a picture but eventually he gets fed up. Rylan's Christmas present to us. Written on December 28, 2005 by Kevin. No, Rylan did not take a trip to the mall and pick out a gift for his parents but he did certainly give us something great. Up until now, Rylan has been known to focus on the TV and high contrast images. Christmas Eve however brought us a great gift. We assisted Rylan in opening his presents but to our delight, he really began to focus on his new toys. This was the first time that we really had noticed that he was seeming to take an interest in toys. He now loves to smile and talk with his new friends. His conversational skills have improved greatly as well. We are now able to talk with him and he will respond and he generally seems to want to talk back. He will lay down next to his toys and talk with them for quite a long time. This was certainly a great Christmas gift from Rylan to us. I find it so amazing that all of a sudden, he takes an interest in the toys when before, he would barely give them a look. I can definitely say we enjoy his gift the most and cant wait until next year to see what he decides to give us then. Written on December 27, 2005 by Kevin. After having four days of Christmas fun, it is now over. The end result is that Rylan scored big. The cute little boy ran off with so many new goodies, it isn't even funny. Our Christmas began Friday night when we took Rylan over to his grandpa's house. 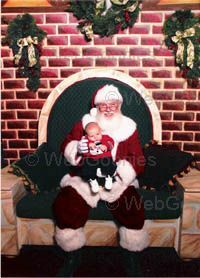 Rylan received a Bumbo chair which is pictured in the photo. I will certainly be doing a review on this item soon. He also received a gift card to Children's Place. I think it may be more of a gift for my wife though as she simply loves that store. Christmas Eve, took us to Rylan's other grandpa's house. This time Rylan received the great gift of money. An all mighty piece of paper that has already gone into his savings account. Funny memory of the night, Rylan had a diaper blowout and pooped all over his grandma. Everyone laughed at the situation which ended up making Rylan upset. Shame on them for laughing at my son. Christmas day was full from start to end. We began the day by going to Grandma's house at 8:00am. Rylan did very well and slept through the majority of it and was calm the rest. He made out with new clothes, some toys and a United States Savings Bond. Later that day, we went to my sisters house to open even more gifts. Rylan received the ultimate gift, diapers. Unlike other things that kids may never use, diapers will be. Often. To wrap it up, we exchanged gifts with my wife's Aunts. Rylan once again received a whole bunch of gifts including more clothing and toys. My wife and I woke up early to do a bit of shopping. Rylan on the other hand, was not going for it. He was up nearly all day long and would not sleep for more than about 20 minutes. I'm not sure what got to him but shopping was not in his schedule. The verdict is, being cute will get you a lot of gifts. We are now nearly set on baby clothes for the next 6+ months which will certainly help out and when Rylan skips to the next few sizes of diapers, we are prepared as well. Rylan certainly appreciates all of the love and gifts that he received this weekend, and so do we. Written on December 23, 2005 by Rylan & Kaitlyn. The time is almost here when mom and dad say I get to open gifts! My daddy told me not to feel bad if I cant open them myself and because he and mommy would help out. My mommy and daddy are so great. I can't wait to see what Santa brought me. I know that I have been a good boy, sleeping through the night and I try to burp the most I can. I hope that Santa doesnt consider massive pooping a bad thing. Last weekend I got to go see my great grandparents again. I smiled at my great grandma and she just loved it. My great grandpa is blind but I think that he still enjoys being around me and loves me just the same. He sure is a joker. Mom and Dad made cookies for them and they loved eating them. 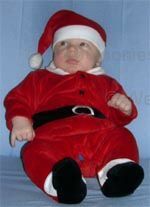 Look at me all dressed up in a Santa outfit. My grandpa got it for me and I really like it. I wore it to the great grandparents house and they really liked it as well. I like to call myself, Santa's little helper. Maybe someday I will grow up to be Santa. I will let everyone know which gifts Santa left me, I can't wait. Have a happy and safe holiday! Written on December 19, 2005 by Kevin. This weekend I spent a lot of time holding Rylan and just playing with him while he smiled. He is at a point now where you can tell he loves to watch our lips and enjoys the sounds coming from our voices. He seems truly intrigued by it all. He cant help but smile when he hears a new sound. With all of this smiling, it began to make me wonder, how does Rylan know that smiling and happiness are one in the same. From birth, how do we understand that a smile is related to happiness while a frown is related to sadness? From another view, how is it that a smiling baby will nearly always make someone smile themselves? Could it be the pure innocence in that smile that we love that makes us smile ourselves? Do we look at that smile and think deeper into how that child may benefit the world years from then? Any psychology majors want to take a stab at these questions? Written on December 16, 2005 by Kevin. My wife and I spent the last 2 nights baking cookies for family and friends. The key to a good cookie recipe is 1 sleeping baby. Rylan has made us proud and slept through 2 nights of baking while we work like grunts behind the counter. The cookies turned out great and sure seem to be a hit at my work. This was the first year that my wife and I had made cookies but I think we did well. 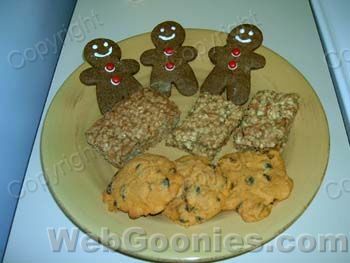 We chose 3 types of cookies, butterscotch oatmeal bars, pumpkin raisin cookies and your generic gingerbread cookies. I have attached the recipes below the image for anyone interested in trying these. We used 2 boxes of store bought gingerbread cake/cookie mix. Preheat oven to 375 degrees F (190 degrees C). Combine flour, baking soda, and cinnamon in small bowl. Beat butter, sugar, brown sugar, eggs and vanilla in large bowl. Gradually beat in flour mixture. Stir in oats and butterscotch chips. Spread dough into greased 15 x 10 inch pan. Bake for 18-20 minutes or until very lightly browned. Drop one inch dough balls onto greased cookie sheet. Written on December 16, 2005 by Rylan & Kaitlyn. I am nearly 2 months old now but I tell ya, it doesn't feel that way. Time sure has seemed to speed up. It seems like just yesterday that I was heading towards the light. I am working on crawling and standing now. My little legs can keep me upright for quite a long time now. I am really anxious to get moving because this whole laying in one place for long periods of time is just not my cup of tea. My mom works with me everyday trying to get my legs a little bit stronger. The best is when she has me doing squats and I fart. Very funny I tell ya. I have become a very chatty little boy. My dad has been trying to teach me how to say "hi" and while I can make a noise very similar, I don't think I am there just yet. I love when mommy and daddy talk to me and I just cant help from smiling. They sure love me. We all went to a festival last weekend. It was fun sleeping on my dads chest while he got a chance to spend some time with mommy. It only lasted a little bit though because he had to go into work. We were there so long and even with my help, we just couldnt get it done quick enough. As seen in the picture, I began to get irritated with it all. Written on December 15, 2005 by Kevin. It has been a busy week at work and I just cant find the time to write a good post today. I leave you all with a few of the best posts from other daddy bloggers that I have seen over the past week or so. DaddyDaze has a great video podcast that you should check out. Click Here to subscribe. ModernDayDad checked into a few "Scooters, bikes, and other conveyances for fresh legs" and gives some helpful information. Feel free to leave a comment with other worthwhile posts that you may have seen recently. Written on December 14, 2005 by Kevin. When you are expecting a baby, everyone tells you that you will never sleep the same again and that you will be so tired you may think your going to die. While this may be true for some, it wasn't until Rylan was about 6 weeks before I began feeling "sleep deprived". While I do work, my wife certainly works too (taking care of Rylan) so we were both waking up at night to change or feed Rylan. My job was simply to change Rylan and get him prepped for my wife who would feed him. My secondary job was to muster up the energy to talk to my wife and keep her awake and entertained. Many people questioned me why exactly I was up when I really didn't need to be, the answer to that is, I try to be the best father/husband I can be. Rylan is now 8 weeks old and for the past few weeks has been sleeping through the night. It seems that Rylan was simply testing me and wanted me to get to the breaking point of sleep before he made the change to sleeping through the night. While I can't imagine its fun for him waking up in the middle of the night either, he sure seemed to enjoy letting us get less sleep. We were averaging about 5 hours off/on sleep which to some may not seem that bad and I would have to agree. Rylan was really never that bad with his sleeping. Now that he sleeps through the night, I wake up occasionally to make sure everything is OK. He tosses and turns a lot however never seems to wake up. I look forward to more full nights of sleep. Written on December 12, 2005 by Kevin. Only in Arizona would anyone celebrate a tamale. This weekend, my wife and I took Rylan to the Tamale Festival. They had about 50 booths, some selling food and others giving away freebies. They had numerous groups selling tamales and I assume they wanted you to buy from each of the booths to determine who made the best tamales. We didn't try any of the tamales but we got a bunch of freebies. Mostly Mexican dessert foods which unfortunately aren't my cup of tea. We did get a chance to try some churros which turned out pretty well. They had a live band to blast out Rylan's ears however he did great, and slept through it all. I got a chance to use the Snugli the entire time and was surprised to have no back pains afterwards. The only person to comment on Rylan, was a bum (go figure) and I think she was more focused on getting her fix rather than Rylan. Overall we had a good time until we had to leave due to a work issue (sure is fun being on call). 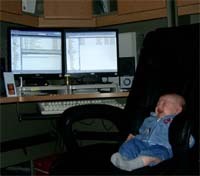 Rylan and I spent the next hour at my workplace fixing a server issue. Written on December 9, 2005 by Kevin. I'm sitting here on my lunchbreak, talking to my wife on instant message and the following conversation took place. This is quite possibly the most entertaining bit of conversation I have ever read. I only wish that I could have been there to see my wife's face when she saw what was waiting for her. I can imagine it was classic. [11:13] Mom: oh my god... you should've heared and smelled his fart..
[11:15] Mom: brb. if I don't get to talk to you again... I love you. [11:25] Mom: I feel like I'm going to throw up. It was nasty. It sure is fun to be a parent. Something seems to be happening up at the north pole because Frosty and Santa sure seemed frightened. I came across this product when shuffling through a catalog here at work and it caught my eye. They are in fact bottle huggers and come in a few different characters including the ones pictured above and a turtle or duck. The idea behind them is to give a child something soft to hold onto as well as something that may keep their attention more so than a plain bottle. The photographer could have done a better job at these pictures however as each of the characters look scared. I guess I would be too if a bottle was going to be shoved in my mouth. Written on December 9, 2005 by Rylan & Kaitlyn. Another week has passed and unfortunately, not many things have happened. One thing however is that my poop has begun to stink. Now I get to gross mom and dad out when they change me. The faces that dad gives sometimes are really really funny. Speaking of my dad, I sure miss him during the daytime. He goes to work but when he comes home, I sure love to be near him. I am still working on this smile thing. I do it a lot when mommy or daddy make funny faces at me and I really like the mobile that dad made for me. I can stare at that thing for ages, or atleast until it stops spinning around. Then I get fussy until they turn it back on. Suckers! Dad took mom to a craft show last weekend and all of the older ladies just loved me. Maybe they thought I was for sale because they all wanted to take me home. I love being adorable. That's all for now, more to come next week. Have a nice weekend. Written on December 8, 2005 by Kevin. I recently made a post about the bulk Huggies Diapers that we got from Cotsco and how fast we use them up. We also picked up a pack of their Cotsco brand wipes. While I have read a lot of complaints against them, overall I think that they work fine. They do have a tendency of sticking together as many people have reported but I have never pulled out more than 2 at a time. I figured that I would perform a bit of scientific calculations on these wipes similar to what I did with the diapers. Written on December 7, 2005 by Kevin. I recently read an article entitled Bye-Bye Diapers from the CBS news that explains how a women had her daughter potty trained at 12 months old. This certainly is a very inspirational article and gives me hope that I can get Rylan trained around that time frame. The possibility of saving money on diapers and just eliminating the act of changing would be great. While there is no set time frame when a child should begin potty training, it appears to be a matter of knowing the signs that your child is going to be needing to go. I read another article a few weeks ago that said it was pretty common in Australia (I believe) to have your child potty trained at 12 months. When I began this blog, I laid out my expectations for Rylan for the first year (displayed to the left). I marked him as potty trained at 6 months. While looking back at it, 6 months may be a bit early, but 12 months now seems do'able as long as Rylan is ready and we can detect his signs. While we will not ever push him towards his uncommon ability, we certainly will accept it if he will. Written on December 6, 2005 by Kevin. We have medicine to fix illness and massage to fix aching muscles, but ultimately, we have a babies smile to cure all. There are days at work that are stressful and days that are extremely boring. No matter what the day may hold however, I can always know that I will return home to a smile from my wife and baby. Rylan has been randomly smiling soon after his birth but just in the past 2 weeks he seems to be doing it in response to our actions. He enjoys the common exaggerated expressions that we throw his way and really enjoys the high contrast mobile that I made him. I think that all parents can agree that no matter how bad the fussing may get, when your baby smiles it totally changes your mood. It really can open your mind up and make you forget why you were so stressed out in the first place. A babies smile is truly one of natures cures. I can only imagine that a babies laugh has the same awesome power. How can the face in the photo of the day not cause you to forget all of your worries? Written on December 5, 2005 by Kevin. I can definitely see that Rylan has begun to understand the difference between night and day. For the past 4 nights now, he has let us sleep about 7 hours straight. Over the weekend, he would wake up and get his normal change and feeding and then went back to bed for another 4 hours. It certainly is a lovely thing getting more sleep at night, especially during the work week. We did nothing special to get him adjusted, just tried to get him down to sleep each night around the same time and eventually he did the rest. He now stays awake most of the day which can be good or bad depending on how he is acting of course. The grandparents sure seem to enjoy it more now that he is awake though. Now let me explain the bad part about a newborn starting to learn a schedule. Now that he sleeps all night and is awake most of the day, its much more difficult to take him out. Because he is awake, a lot of the time he may want to be held and bounced which obviously at times is not possible. Last night I was hoping my wife and I could sit down for dinner out but that was interrupted by his crying. After 15 minutes of him crying and us trying to sooth him, we decided it was best to just leave and take the food home. His new schedule surely could be taken as bitter sweet it seems. While we love seeing his open eyes, its nice sometimes when he is sleeping so we can get some food in our bellies. It seems that regardless how tired he may seem, when food is around, he is awake and wants to be held. P.S. To the bus boy who brought us our to-go boxes, thank you. You offered to package my food while I sat there with a baby in my arms. I understand your job is to help the customer but this is above and beyond in my opinion, so thank you. Written on December 2, 2005 by Rylan & Kaitlyn. On my previous post I said that if I found out any further information about Santa, I would let you all know. Well, I figured out that he had a white beard and a red suit. I got my picture taken with him so I have proof that Santa does really exist. I don't have much further information on Santa though so if anyone has anything they can tell me about the guy, please let me know. Thanks. My daddy got a surprise last night that made my mommy laugh a lot. My dad was holding me as he always does and his finger slipped into my diaper. Like an oil stick into an engine, he pulled out oil. Yellow oil that is. That sure was one poopy diaper but boy was it funny to see dad try to get that taken care of. I think that I may be getting this night and day thing down. I have been stressing my mom out by staying up nearly all day and when daddy gets home, I want to be around him as well. Last night I slept for 7.5 hours. Talk about good sleeping. With it getting cold now, mommy and daddy are having a difficult time trying to find the best sleeping temperature but last night sure seemed to be nice. I think my dad told everyone about the lady who wanted to hold me. She was creepy and bossy. I know that I am a cute baby but why do people think they can just hold a baby like me. I saw her kids dropping food into my carrier. MY CARRIER! Who do they think they are?! They need to learn some manners like I have. I guess that is all for now, I will report to everyone again if I find any further information about Santa Clause and again, if you know any, please leave a comment letting me know. Thanks everyone. Written on December 2, 2005 by Kevin. 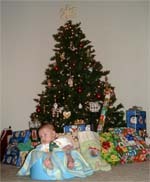 AJ from thingamababy.com recently let me know of his request for blogging parents to post gifts that they would purchase if price was no matter. Rylan is just over 6 weeks old now, and while there are few gifts that he could use at this time, there are things that we have looked at that we certainly wish we could get for him. Here are a list of items that we would love to get him as well as 3 additional gifts that we would love to purchase for ourselves as parents. Bumbo Baby Seat - A chair designed to let babies sit upright to help strengthen their backs and give them a new look on things. I have only heard good things about it. Flutterbye Dreams Lullabye Birdies Mobile - This would match our crib soother and allow us to control it remotely. Baby Gymtastics Play Wall - While this is quite a few months away, eventually a toy like this would allow Rylan a lot of entertainment. Decathlon Odyssey Convertible Car Seat - Per Amazon customers, one of the highest rated car seat. Gift certificate for Children's Place. - My wife simply loves the clothes here and Rylan looks great in them. Bugaboo stroller - These strollers are likely some of the most expensive ones on the market, if price was no matter, why not get the most expensive? A maid and cook - These would help free up some more time for my wife and I to spend with Rylan. A lifetime membership to DisneyLand with free travel and board - This would be my wife's ultimate dream. Written on December 1, 2005 by Kevin. After I knew that my wife and I were having a baby, I quickly went out on the web and searched around for information. One thing that kept popping up on sites was the fact that babies are fascinated with high contrast images. I have since found toys that are strictly black, white and red and are sold as developmental toys. It is said that the connections in the brain can decrease or increase by up to 25% depending on the stimulation and environment your baby receives. When researching websites, I found numerous posts from dads talking about their experiences with showing their babies high contrast images and I knew that I wanted to do the same. These images I like to consider developmental experiments. Experiments are the reason for having the baby in the first place right? The other day I decided to finally get around to making some high contrast images. I laminated the 2 together and tied some ribbon to it. I have since hung it from our mobile and I have to say, Rylan certainly enjoys watching it spin. 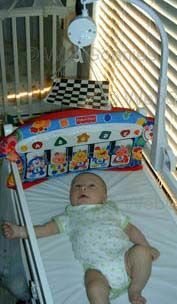 We used to have a Winnie the Pooh mobile that Rylan enjoyed but would not stay locked deeply onto. The images that I created however will keep his attention and generally soothe his crying when we are changing him. Eventually, Rylan will get bored of these images and I will swap them with some new ones. The second part of this experiment will be to test different images. My idea is that if I show Rylan a picture of a dollar sign, will he become a millionaire? If I show him a picture of a Mickey Mouse head, will he become a Mickey fan? Only time will tell. Below are 4 high contrast images that I have threw together. I currently use images #1 and #2 with great results.